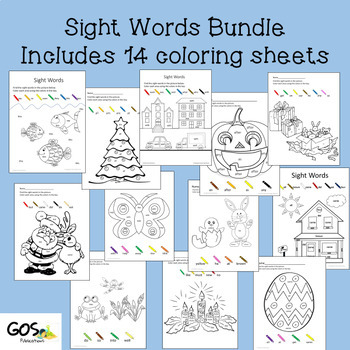 These fun coloring sheets are perfect for the Kindergarten classroom.5 sheets are included and cover 29 different sight words.Use them for centers, for extra practice, or as an extra assignment for students who finish early.Want more practice? 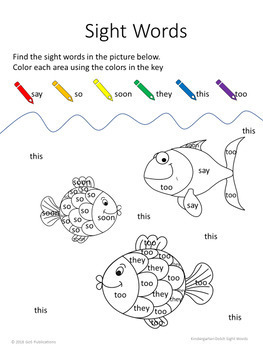 You can change the sight words to meet any level. This Halloween themed coloring sheet includes "a" words from the First grade sight word list. This is great for centers or extra practice to reinforce words you are learning in the classroom. 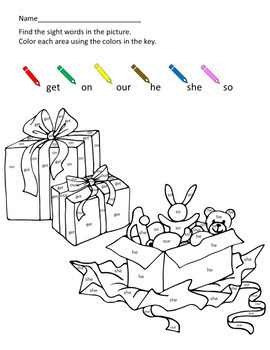 This packet includes 4 holiday themed coloring sheets and 3 pages of flashcards utilizing the Primer Dolch Sight Word list.This is perfect for centers, for an activity for those who finish early, as reinforcement for students who need extra practice, or for the emergency sub folder. (The kindergarten pack, the Halloween sheet, the Christmas pack, and the Spring/Easter pack) As more packs are added, they will be loaded. 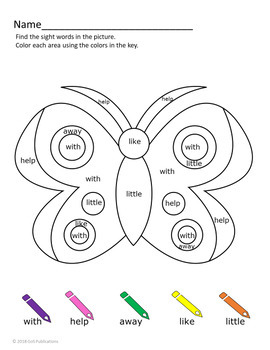 Great for early finishers, for centers, or for year-round sub plans.